Land Rover Discovery Interior, Sat Nav, Dashboard | What Car? SUV fans will love the penthouse view of the road you're given from the Discovery’s comfortable driving seat, which feels significantly higher than its rivals. And it’s easy to set everything up just how you want it, especially in SE models and above, because 12-way electrically adjustable front seats come as standard and include adjustable lumbar support. There’s lots of up-and-down and in-and-out movement on the steering wheel, whichever trim you choose; you have to make adjustments manually on S and SE trim, but range-topping HSE and HSE Luxury models have a powered steering column adjustment. The Discovery’s dashboard is also very user-friendly, thanks to clear dials and chunky buttons designed for you to use even while wearing gloves. HSE trim and upwards gain a 12.3in configurable digital instrument cluster similar to Audi’s Virtual Cockpit. It's very clear and can show lots of information, but it isn’t quite as configurable as the Audi one. There’s also the option of a head-up display on most models. Lots of glass and a lofty driving position combine to give you a great view out in all directions. Forward visibility is particularly good, so it’s surprisingly easy to thread the Discovery along narrow urban streets or between tight hedgerows. To help with night visibility, SE models and above get more powerful LED headlights as standard. These are upgraded with high beam assist on HSE Luxury trim, although we found this system to be inferior to that in premium rivals by taking too long to switch from high to low beam and back again. The Discovery is a long car, so seeing out of the back isn’t quite so easy. Thankfully, all Discoverys get front and rear parking sensors plus a rear-view camera as standard to help with reversing. And if you’re a particularly nervous parker, you can specify a surround-view camera which gives you a bird’s-eye view of the car. If you plan to use your Discovery to tow, it’s worth considering the optional tow assist system. This enables the driver to guide a trailer into position by simply following its trajectory on the main touchscreen and controlling its path using a rotary knob between the front seats. 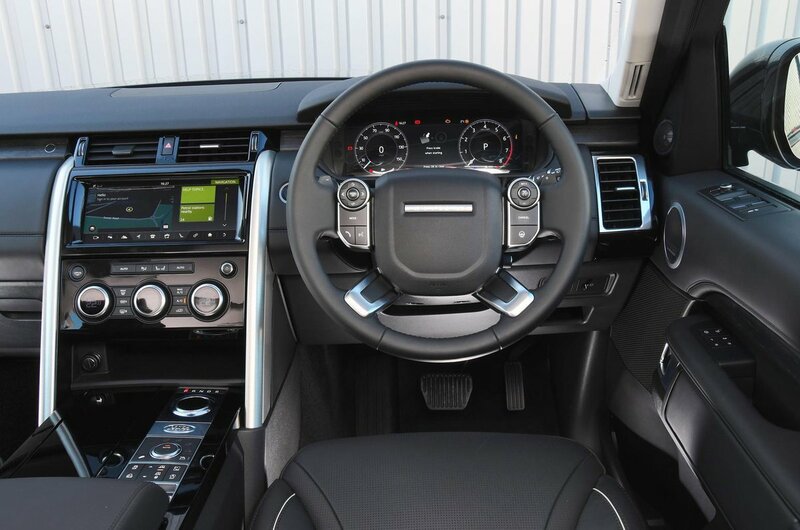 All trims have a 10.0in touchscreen infotainment system with Bluetooth and a DAB radio. When you step up from S to SE trim, sat-nav, a Wi-Fi hotspot and a more powerful stereo become standard. The infotainment system is a bit dim-witted; it can make you wait while it processes commands. Being a touchscreen, the icons can be tricky to hit without diverting your gaze from the road for longer than you should. That’s one reason we favour the BMW X5’s iDrive and Audi Q7’s MMI infotainment systems, both of which have a less distracting rotary dial interface. It’s also worth mentioning that even our taller testers found the top left of the screen to be a bit of a stretch. 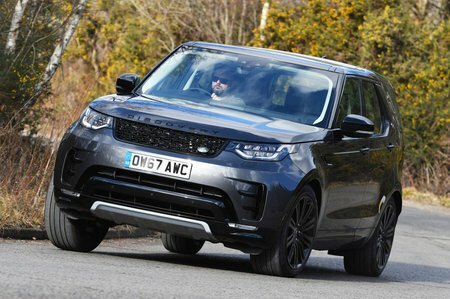 That’s down to the sheer width of the Discovery and the fact that the infotainment screen is tilted upwards slightly. 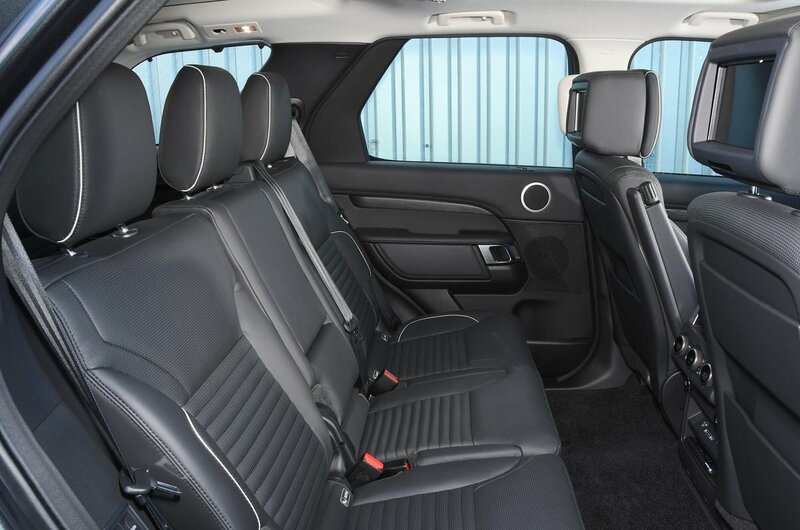 Other options on the Discovery include a dual-view screen (the front passenger can watch TV while the driver follows sat-nav instructions), and rear screens on the front seatbacks to keep the kids amused. The Discovery’s interior feels suitably upmarket. Okay, there are a few more hard plastics and rough edges than you’ll find in a Q7, but you’ll have to hunt for them – the areas your hands regularly come into contact with feel solid and look effortlessly classy. Likewise, the dashboard buttons and electric windows switches don’t operate with quite the slick precision they do in the Q7, but they feel anything but low-rent.